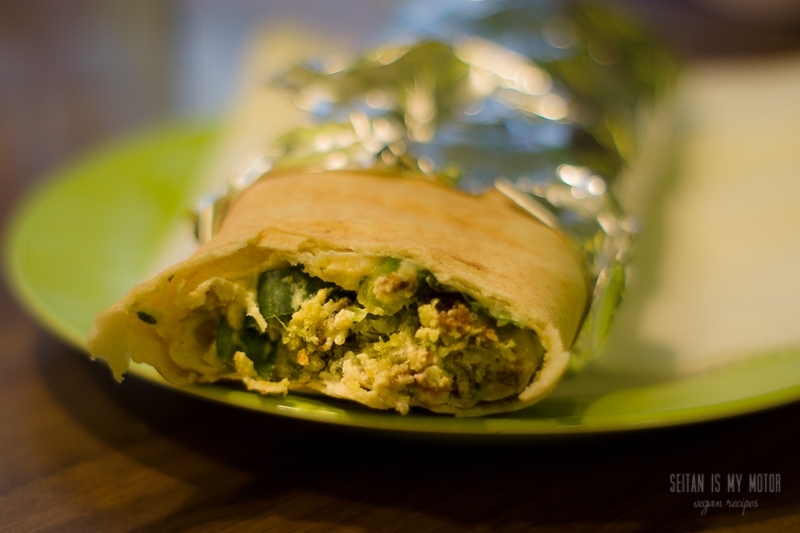 I know you probably do not want to look at a half eaten falafel. 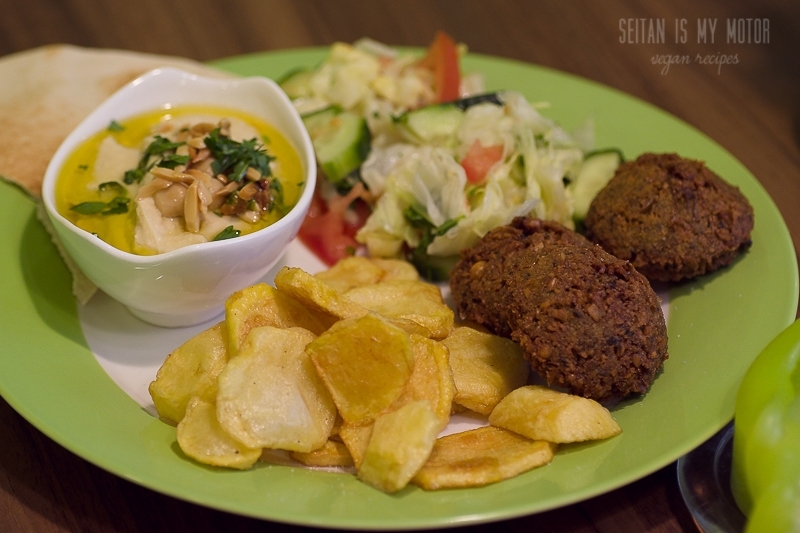 So here’s the falafel on a plate, served with fried potatoes, salad, flatbread, and hummus. 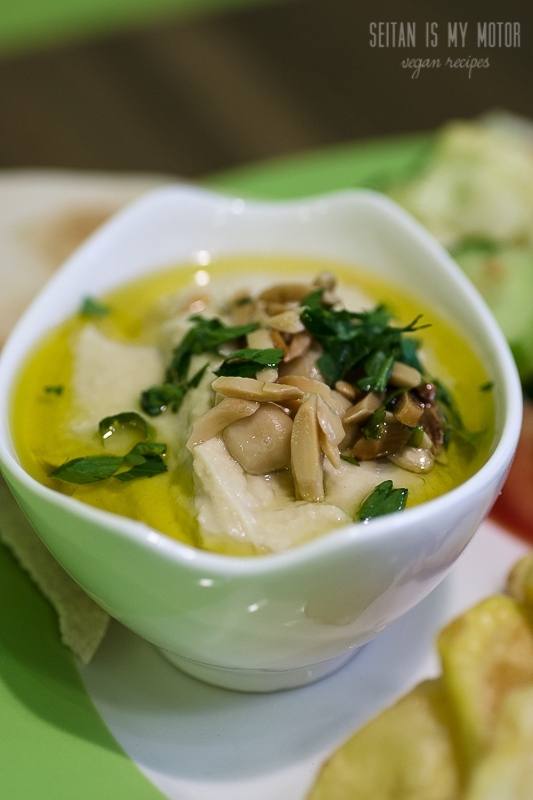 And here is the fantastic hummus all by itself: I love the fresh herbs and toasted almonds on top! F. had a lentil soup, which she loved, too. The consistency is not as thick as I am used to, but it’s very flavourful and I can definitely recommend this as well. F. demands this soup almost once a week. Since Memo opened we have been there a lot. They have a great fixed menu to choose from (soups, appetizers, main dishes, snacks) and although a lot of food is made with cheese and/ or meat, you only have to tell them what kinds of foods you don’t eat and they will accommodate you. This is especially great when it comes to their daily lunch offer. 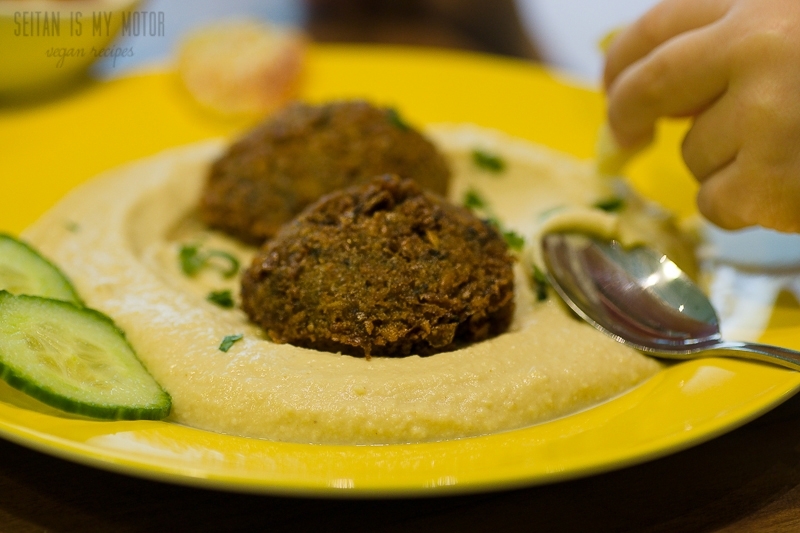 Like the rest of the food these dishes are of Palestinian, Arabic, and Lebanese origin. It is a different dish every day, which you can order for 4.90 €. 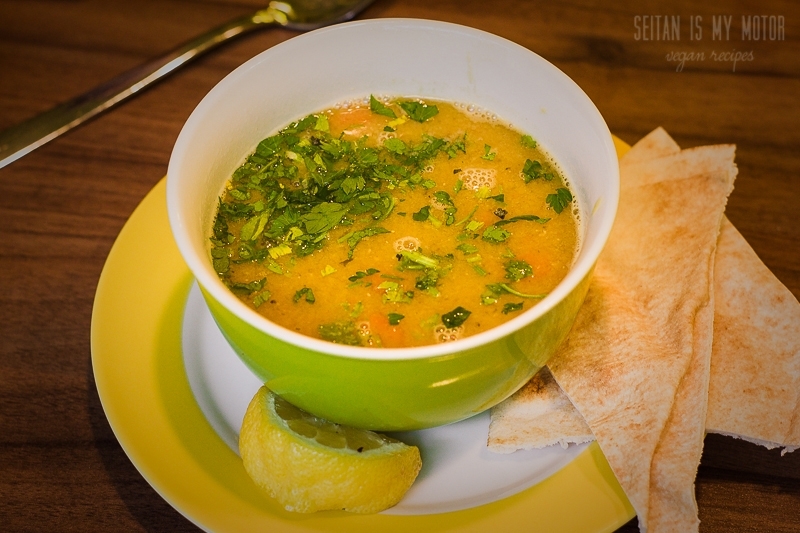 Although this dish is always made with meat, you can order a vegan version without any problem. Just let the staff know. I often order the lunch offer for work and believe me I really look forward to my breaks on these days! I have had mahashi (stuffed zucchini and potatoes), tabule o fatayer (tabouleh and stuffed pastries), bamieh (okra with tomato sauce and rice), and my favourite: batata belhame (a casserole dish similar to a shepherd’s pie – so good!). There’s a new and interesting dish every day and I am super grateful for getting to taste and learn so much about this kind of cuisine. The staff is very friendly, attentive, and helpful and the service is absolutely great. 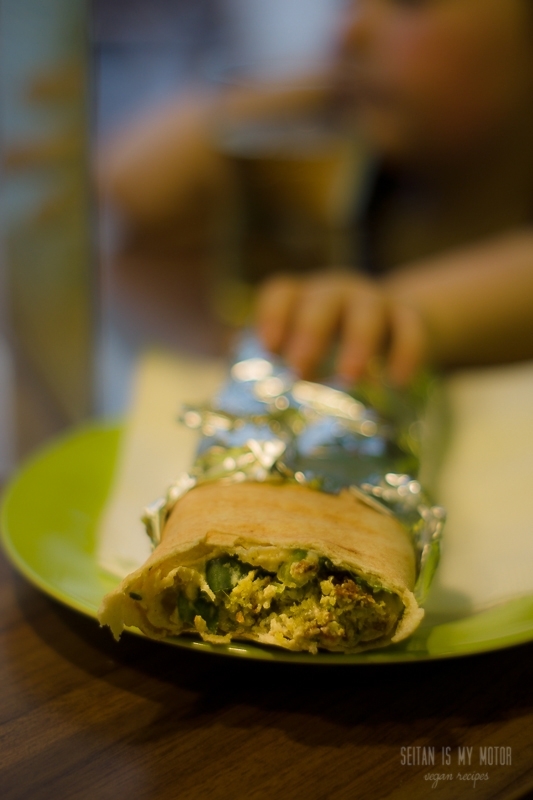 Although she often feels grown up enough for a whole falafel roll. In that case she just steals mine! If you visit Dresden, please make sure to visit this little restaurant. I am sure you wil love it! For their address, opening hours, and the weekly lunch menu, visit their facebook page.